T-Shirt Fundraising Partnership Benefits 2014 Alex's Million Mile - Run.Walk.Ride. BOSTON, MA--(Marketwired - Jul 22, 2014) - Booster, LLC (www.booster.com) and Alex's Lemonade Stand Foundation (ALSF) are proud to announce a powerful new way to help raise funds and awareness toward finding cures for all kids with cancer. In support of ALSF's Alex's Million Mile - Run.Walk.Ride. event, Booster is providing participants a platform to easily launch their own t-shirt fundraising campaigns. This September, Alex's Million Mile - Run.Walk.Ride. 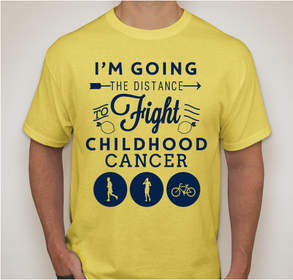 event will return for the second annual initiative, challenging participants everywhere to collectively walk, run, and cycle one million miles to raise the profile of the month, which represents National Childhood Cancer Awareness Month. Unlike many other awareness months, National Childhood Cancer Awareness Month goes largely unnoticed in the public eye, Alex's Million Mile is an effort to change that, one mile at a time. Participants who sign up for Alex's Million Mile will have the opportunity to use Booster to create their own designs and in turn sell custom t-shirts to raise money without buying in advance or holding any inventory. Participants can focus efforts on spreading the word about their campaign using Booster's simple tools and social media integration. Booster's merchandise team handles the rest -- proofing artwork, creating high-quality shirts and delivering them to supporters. Supporters can proudly wear their Alex's t-shirts prior and during the September Alex's Million Mile event. After campaigns have concluded, Booster automatically sends all net proceeds directly to ALSF. To learn more, or to launch a Booster campaign to benefit Alex's Lemonade Stand Foundation, visit the Alex's Lemonade Stand portal on Booster.com at https://www.booster.com/alexs-lemonade-stand. "Participants love wearing custom T-shirts as part of runs, walks, rides and other athletic fundraising events. Supporters of Alex's Lemonade Stand Foundation can now easily create custom t-shirts to promote to their communities without having to buy the shirts in advance or handle any fulfillment, which will raise more funds and awareness for ALSF," said Andrew Moss, President of Booster, LLC. "Booster is proud to power this solution for ALSF, and we look forward to seeing a wide collection of Booster online fundraising campaigns from supporters that will promote and fund its worthy mission to cure children's cancers." "After a successful inaugural year, we couldn't think of a better way to take Alex's Million Mile - Run.Walk.Ride. to the next level than through partnerships with innovative companies like Booster," said Jay Scott, Co-Executive Director of the Foundation and Alex's dad. "Participants across the country will be able to show their support for the Foundation and educate their communities about National Childhood Cancer Awareness Month by donning Booster t-shirts." Booster (www.Booster.com) is the best way to raise money and awareness for your cause, passion or project. Our social fundraising platform provides simple online tools make it easy to rally support from friends, family and the community. Anyone can use Booster to sell t-shirts or other merchandise without having to buy or handle inventory, and also accept donations for additional support. Booster was created by CustomInk (www.customink.com), the leader in custom t-shirts for groups and occasions. Since its founding in 2000, CustomInk has delivered more than 50 million custom shirts to customers nationwide.